Please choose your session from the Menu image above, or more information further down this page. 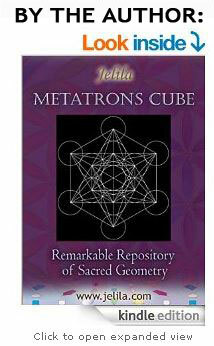 Listen to Jelila explain, on Mp3s at http://www.jelila.com. All sessions are good. All will help you! Just start with what intuitively draws you. 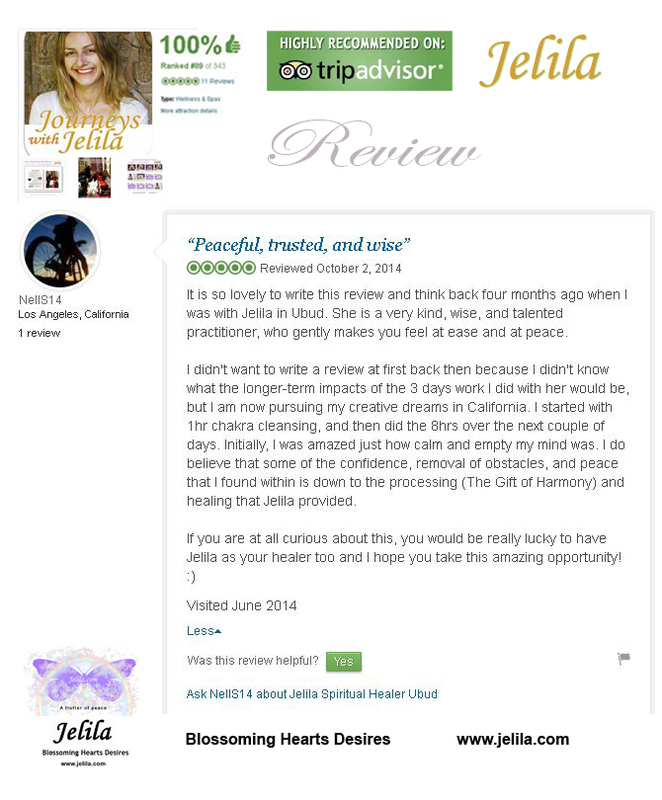 If you want to change once you meet Jelila, usually you can if you’re a solo booking (depends on her diary). 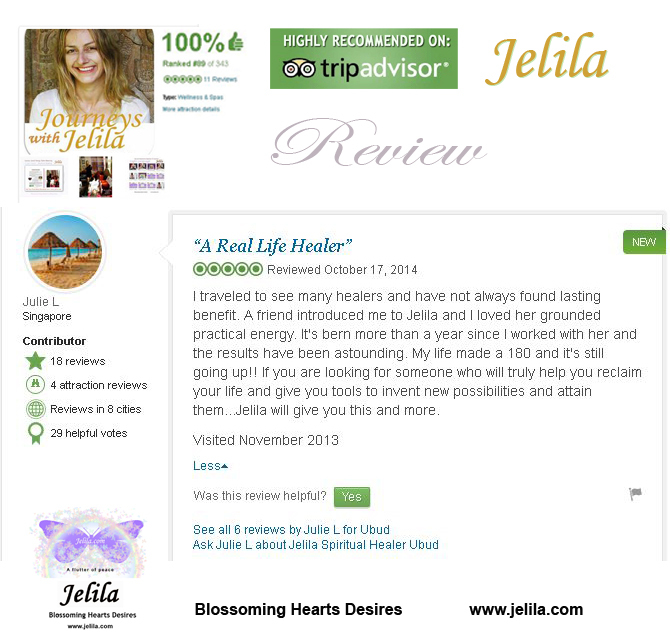 Jelila now has Online Booking. This saves time and eliminates mixups like double bookings. It is super easssy! Takes 5 seconds! We promise! Please visit the Calendly link below, click ‘appointment’. Choose ‘China Singapore Perth’ from the small ‘Times are in…’ dropdown menu to see correct timezone. (Otherwise you may be seeing your local timezone). Click the day you want (if you don’t see it – it is full) – Choose the time – Put your email – Tell us if there are 2 of you, and what session you’d like (if you know) and you’ll receive a notification of your appointment and so will Jelila. Then please prepay to hold your booking. If you prefer to pay cash: please pre-pay by Paypal to hold your booking. 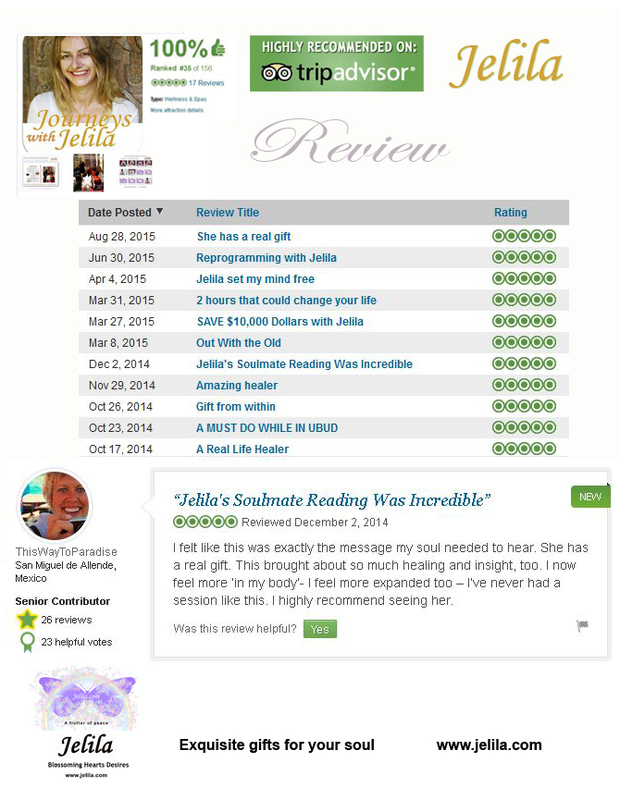 Jelila will refund the transaction at your session and then you may pay cash. If we don’t hear from you by email or Whatsapp, and you haven’t prepaid, we may reallocate your booking to someone else. Being outside of wifi is one thing but unless you confirm your booking with payment or we know you are definitely coming, then we may reallocate it. Jelila is very busy. She has lots of bookings. She doesn’t want to spend her time on messing about with admin. 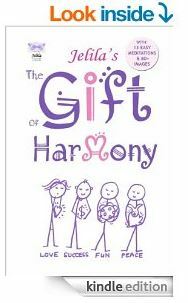 She wants to spend her time where where it counts – on healing you – for your happy life! Please do not take a slot if you are not serious about attending. You are then blocking someone else from receiving Jelila’s gifts. And wasting Jelila’s time. You might be surprised to see the effort and time that goes into preparing for your session. Please cooperate by booking your slot online, then prepaying so we know you are serious about attending. Conditions apply: Cancellation 48 hours: 50%. 24 Hours: No Refund. Sound Healing, Chakra Balancing, Aura Reading, Intuitive Healing or Reprogramming bring you Relief, Results, Answers – or simply to enjoy a deeply moving Spiritual Experience. 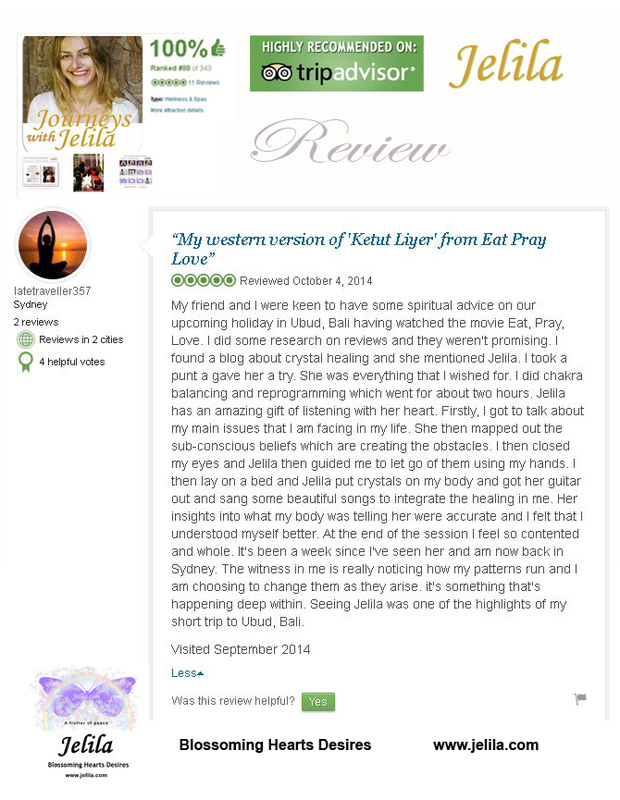 An individual session with Jelila is always a special, life-changing experience – bringing exquisite gifts for your soul. 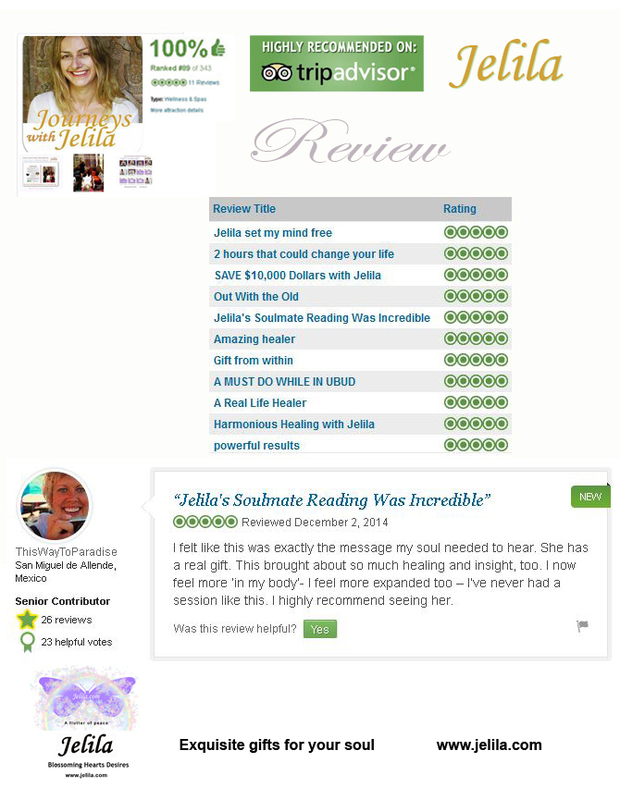 Online Clients – For an online session by Skype or Facetime etc, please Pay Online, or www.paypal.me/jelilajelila (Jelila Healing comes up) then email jelila@jelila.com to book. 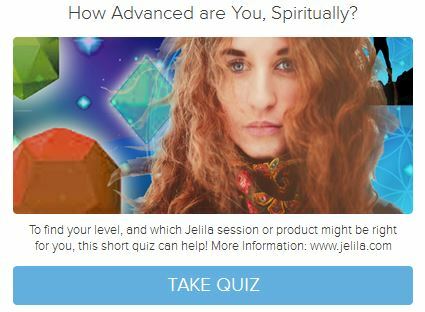 Then, you experience the Power Up using The Reprogramming – like a personal guided prayer, you are guided to release the block, bringing immediate relief. 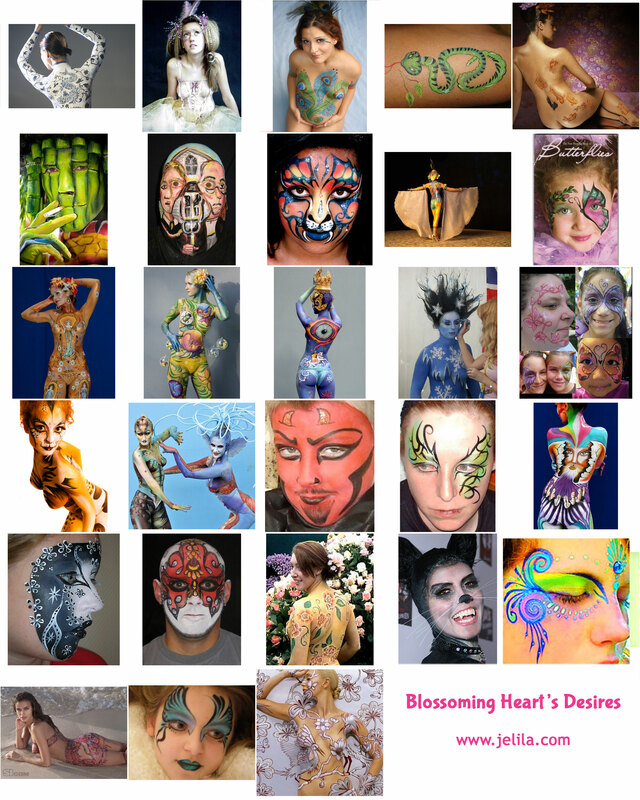 This is a deep land transformative healing experience that includes The Reprogramming. This is a deep healing experience as it works deeply on ‘how your soul feels about being in your body’. It can resolve deep issues of lack of motivation and uncertainty. It helps your soulmate relationship because your relationship with soulmate is a reflection of your own deep relationship within – between your soul and your body. 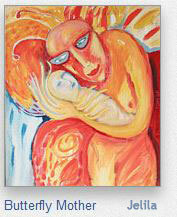 As you resolve issues with that – so your relationship with another ie soulmate – can improve. 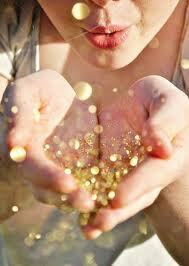 A General Aura Reading is also available, this is 1 Hour, US$60. even if you are picking up/coming in person. 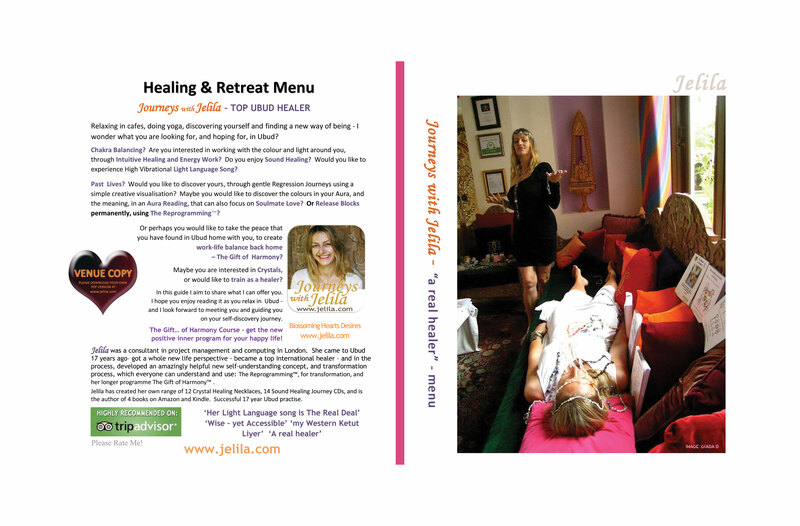 2 Hours US$ 300 Signature Session of The Reprogramming (includes Intuitive healing) and 1 Free healing music CD download by Jelila worth US$22. Sometimes for deep issues, we will fill the whole 2 hours with The Reprogramming, it depends what you need. LIGHT LANGUAGE GRIDS – create your dreams Hand written ‘grids’ of sacred geometric shapes and colours that can heal, manifest, and define how you want things to be. Jelila has appeared at The Balé, Westin, The Four Seasons, Revivo Wellness Resort, and in many magazines including: Her World, Simply Her, Jakarta Post Weekender, That`s Shanghai, Yak, & live on radio in Australia. She is an Advanced Light Language Practitioner and studied under Amana Virani. Previous Menu – Please see above for latest menu!! 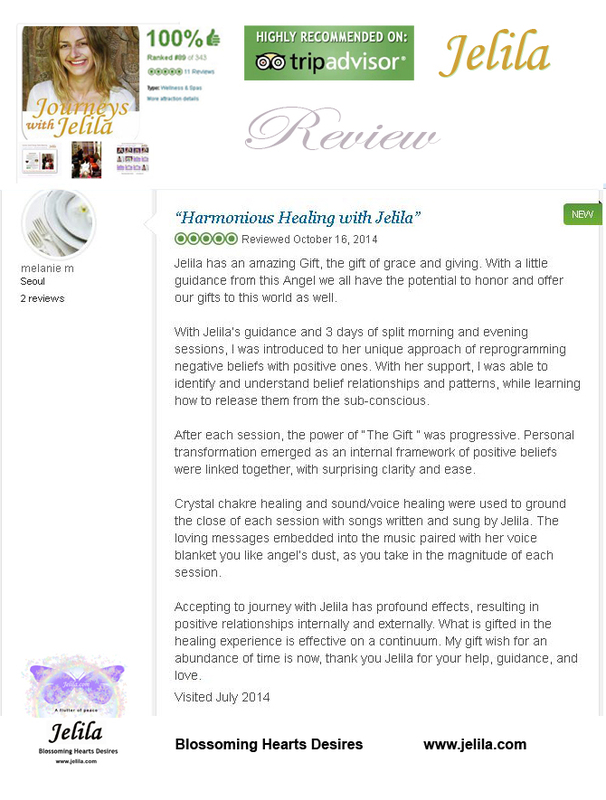 Jelila is a well-known International Healer who brings exquisite gifts for your soul, through a range of different healing sessions including Crystal Healing, Energy Work, Past-Life Journeys, Sound Healing, The Reprogramming™ her Signature Technique, The Gift… of Harmony™ and more. She has appeared in many magazines and in Asia and Bali at top resorts like The Four Seasons, The Bale, The Westin, and Revivo Wellness Resort, and has a wealth of experience and depth to help you – for your happy life! Chakra Balancing / Intuitive Healing 1 HOUR, US$ 80 … Call +62 8585 735 4228 or Whatsapp +62 81339561271 Chakra Healing Ubud Bali. Click Image to Pay Online.